Green Webpage is the ideal domain or web hosting provider for users within a budget. The company has created the perfect platform for small startups and small privately owned businesses to operate, run and control their website without having to go outside their budget, without any loss in quality. Anyone can build and own their own domain with just three simple steps! 1. Pick a custom domain for your company or startup’s website. Ensure that the domain suits all your needs. 2. Choose the ideal template that depicts your imagination. Green Webpage has over ten thousand already made templates – and each template features a unique design. Green Webpage can also a custom site for you if you are not satisfied with any of the pre-made templates. 3. After choosing your template, your new website is completed and you are ready to go. Green Webpage puts emphasis on variety; this is already evident in the number of pre-made templates designed by the company. This is also why the company offers many hosting packages to ensure that everyone has something they need. 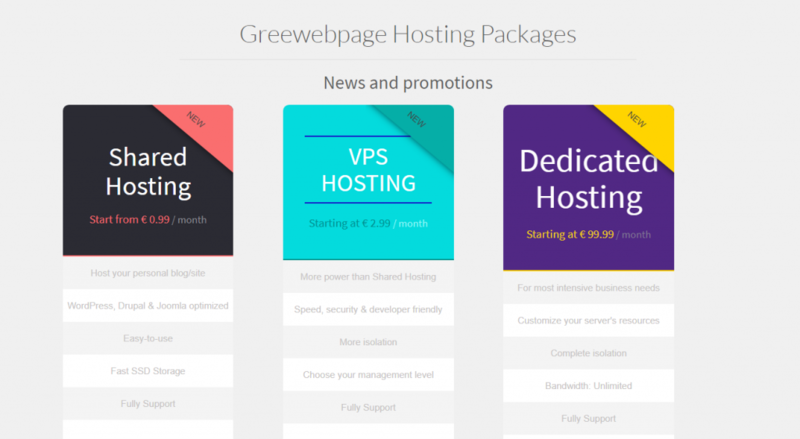 Green Webpage is the perfect web hosting provider for all. Make use of the shared hosting package offered by the company to build your personal website or blog. You can get high performance with the standard speed with little or next to nothing. This package is easy to use and simple to work around. Optimization of WordPress, Joomla, and Drupal. This particular web hosting package offers even more power and efficiency than Shared Hosting. It offers lightning speed, maximum security and a developer- friendly environment to medium-sized and up-and-coming brands. It offers even more isolation and privacy as there is no need for sharing of web space with any other company or individual. Complete isolation and privacy as you control the administration of server space. Full support from the customer care team 24-7 all year long. Developer Option; which comes with unlimited cPanel users and up to 30GB SSD Storage and 1GB memory. Offers unlimited traffic for developers looking to build their online traction. Get a dedicated IP and cPanel branding. This package offers WHM access. Small Business Option; comes with the basic developer options feature as well as 60GB Solid State Driver Storage and 2GB memory. Business Package; this is a complete package designed to suit the needs of large businesses and non-profit organizations. It features all the features of developer and business options as well as 100GB SSD Storage and 4GB memory.